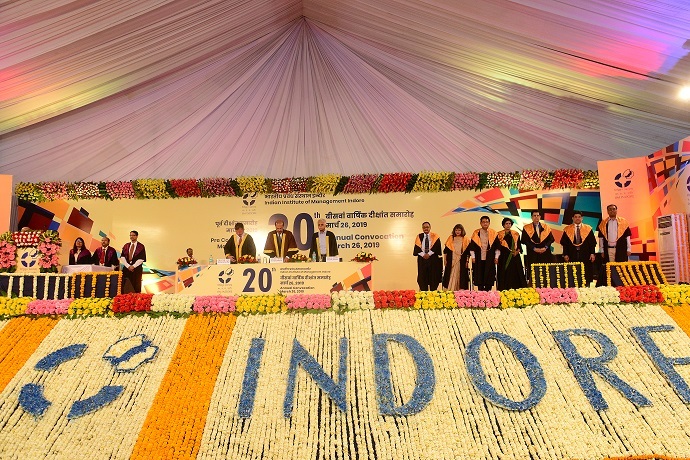 The ceremony began with an amazing and colourful convocation procession where the Chief Guest, Board and faculty members of IIM Indore walked through the aisle towards the convocation venue. 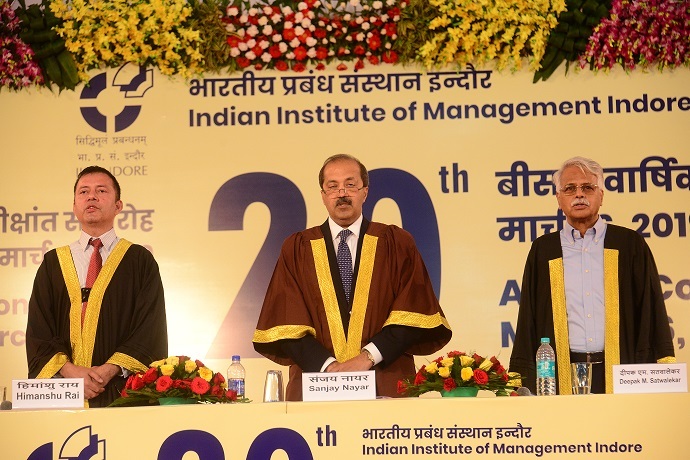 Mr. Deepak M. Satwalekar, Chairman, IIM Indore then declared the convocation open. 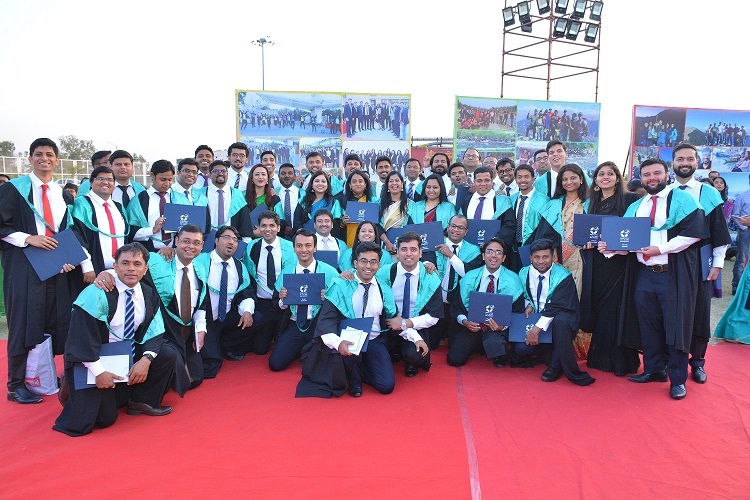 ​Congratulating the graduating students, he said that, ‘You’re privileged graduating from IIM Indore, however, this would help you take advantages of the learnings as you race ahead in corporate world and grab opportunities which come only to a few. You need to focus on your goals, work hard and aim for learnings rather than outcomes and rewards’. Noting that the work culture and environment both are changing at a rapid rate, Mr. Satwalekar said that either you can sort the problems you’re facing today or you can anticipate the problems you might face tomorrow. ‘During this time, make sure to find the opportunities in the problems, or the scenario which is being developed’, he said. Work environment is changing culture is changing and social will be diff from what is today. As you see these changes, will you use what you’ve been taught or anticipate tomorrow’s. He asked the participants to keep their values and principles rock solid and constant. ‘Be true to yourself and always follow your principles, no matter what—for that will help you in achieving your goals’, he concluded. The IIM Indore Gold Medal for Scholastic Performance Rank 1 to Advika Jalan. 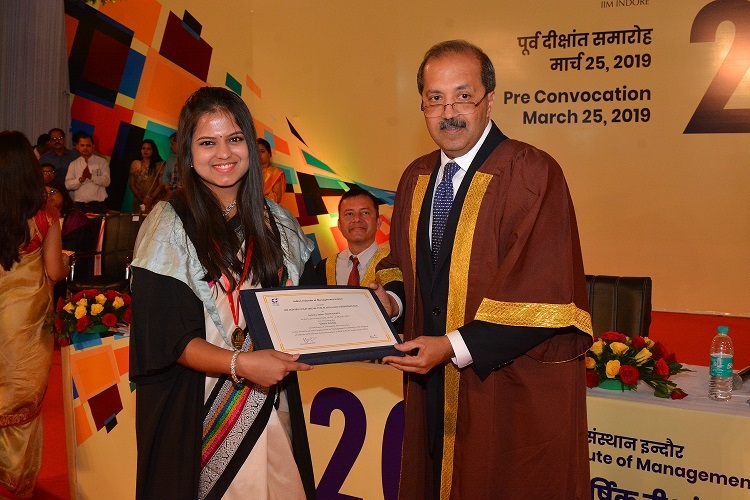 The IIM Indore Gold Medal for Scholastic Performance Rank 2 to Sneha Kavishwar. 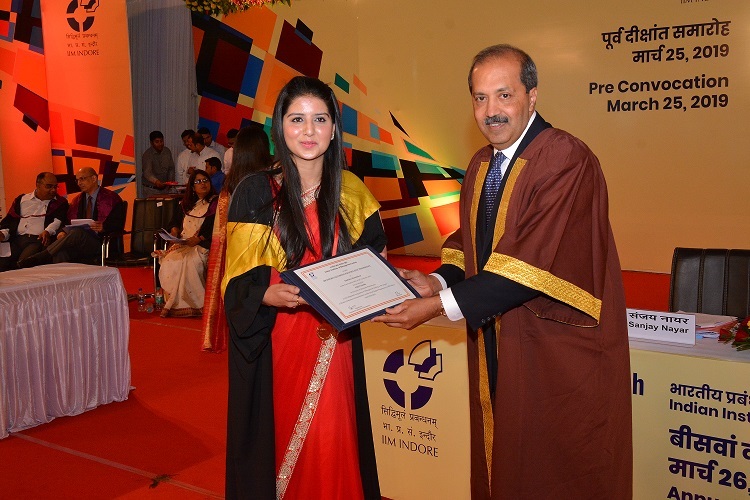 The IIM Indore Gold Medal for Scholastic Performance Rank 3 to Ayushi Goyal. The IIM Indore Gold Medal for the Best Woman Participant for Scholastic Performance to Advika Jalan. IIM Indore Gold Medal for Scholastic Performance Rank 2 to Anmol Madan. IIM Indore Gold Medal for Scholastic Performance Rank 3 to Shaurya Saxena. IIM Indore Gold Medal for the Best Woman Participant for Scholastic Performance to Radhika Khandelwal. This was followed by conferring degrees to the graduating students. Mr. Sanjay Nayar then addressed the gathering. He started his speech by sharing memories in Ahmedabad during his education and his early days of his career. He shared some takeaways from three intersections he faced during his life time— first during his early career, second as a manager and third as an entrepreneur. ‘As a guy who did a job, I learnt that we should preach simple things and give 100% to whatever work we’re doing. We should understand and get the courage to take risks—we may learn this over the years, but risks would help us learn from mistakes. Also, always maintain a balance between professional and personal life, arrogance and humility and remember that you might be vulnerable, but you will still be able to achieve if you focus on your goals’, he said. He then shared his experience as a manager and noted that one needs to walk the talk, for people look up to you, and hence you need to work hard if you want your team to work hard. ‘Small things matter a lot, saying thank you, please, matter a lot to people. Always stay humble and learn from your mistakes’, he said. He then congratulated the graduating participants and said that going forward, they’ll be the torch bearer who will perform in the changing environment. ‘Do the small things that matter to people. People rarely remember your professional qualification but they remember how you feel’ he concluded. 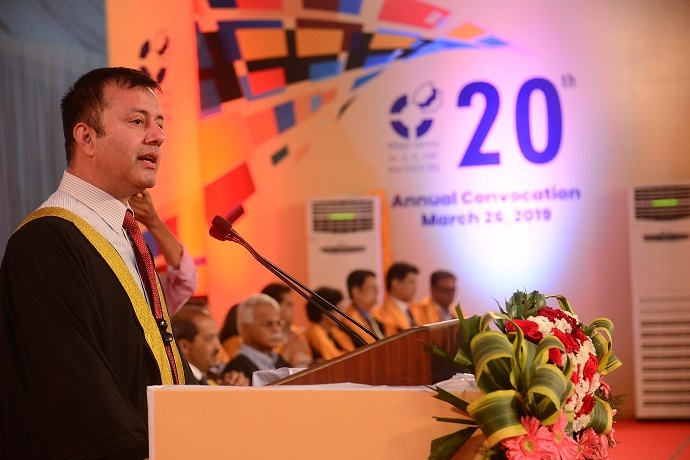 Professor Himanshu Rai also delivered his address. 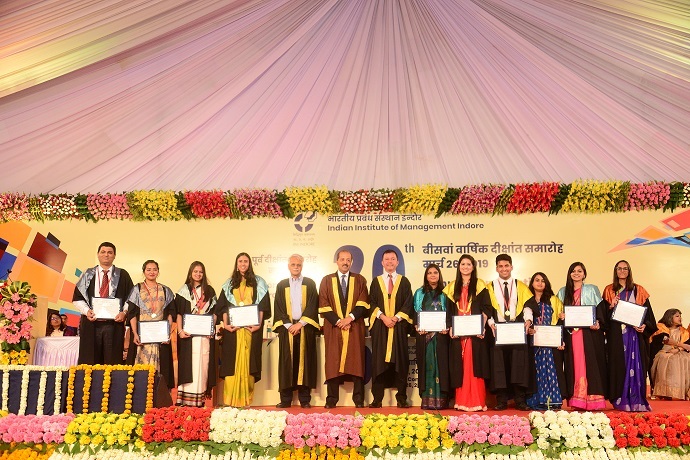 Coongratulating all the participants, Professor Rai encouraged them to learn from the new experiences they’re going to have once they step out of the campus; gain inspiration from the surroundings and the leaders around them; and become a better person in the coming years. 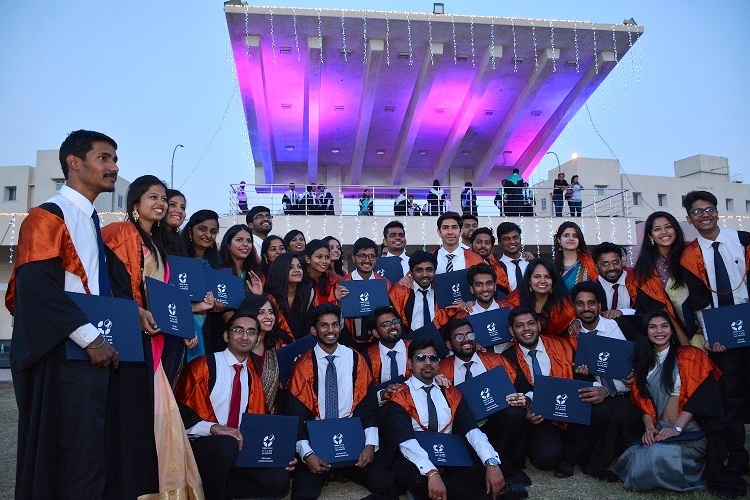 The academic year 2018-19 has been a remarkable one for IIM Indore—with the Institute achieving the ‘Double Crown’ by accreditation from the Association to Advance Collegiate Schools of Business—also known as the AACSB International, making it one of the very few Institutions in the nation with double accreditation. The first accreditation by Association of MBAs –AMBA was earned in the year 2017. 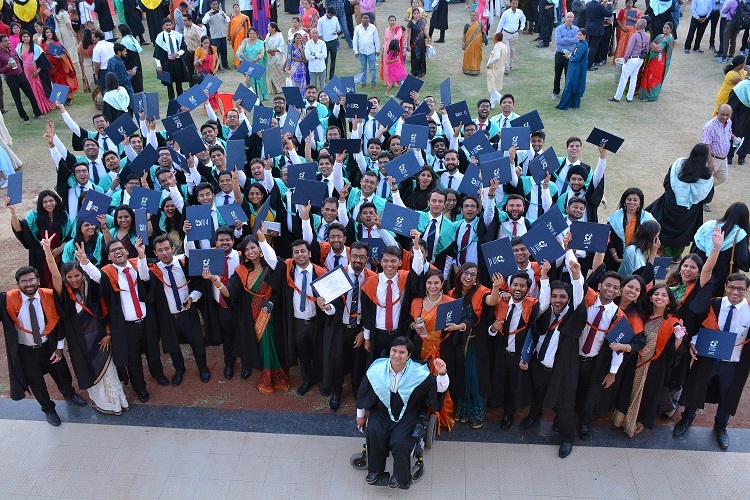 IIM Indore now aims to earn the third accreditation- EQUIS and the process is on for the latter. 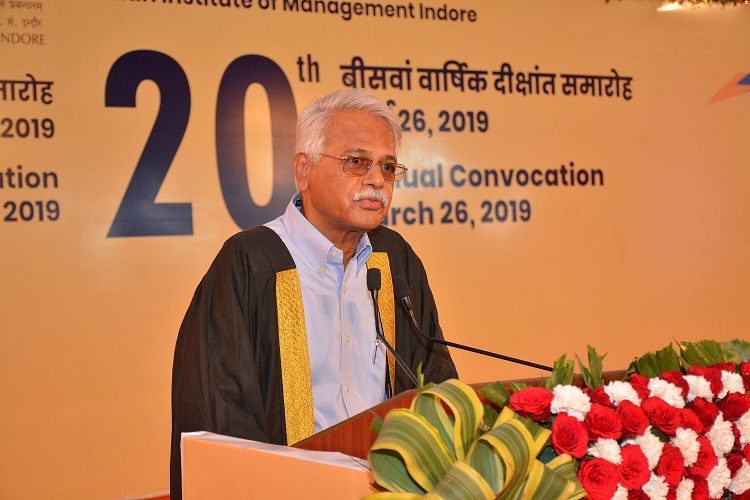 ‘I congratulate the IIM Indore faculty members, staff and all the stakeholders who have worked hard in earning this accreditation and we look forward to many more accolades in the coming years’, he said. He noted that the job of the leaders has become more demanding and challenging in today’s scenario and they think out of the box, find a new paradigm and better solutions for sustainable growth. ‘Greatest leaders also might not also be successful, but they learnt from their mistakes and had the courage to accept failures’, he said. He adviced the students that education doesn’t make one great, but it makes one humble. Ýou’re the future leaders which India needs. 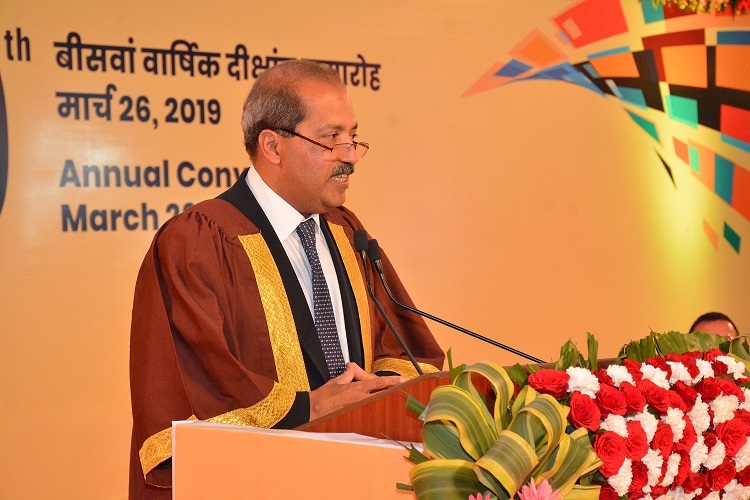 You can only change India and showcase an example of ethical leadership to create management paradigms’, he said while concluding his talk and congratulating the participants. 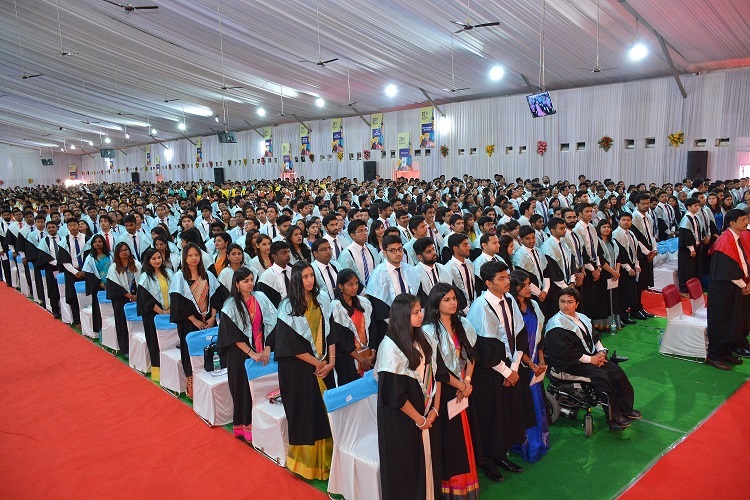 The convocation ceremony came to a conclusion with National Anthem.